Costco, the membership warehouse-club chain, was an early leader in offering electric-vehicle charging to its customers, setting an example followed by other retailers, including Best Buy and Walgreen. By 2006, Costco had installed 90 chargers at 64 stores, mostly in California but also some in Arizona, New York and Georgia. Even after General Motors crushed its EV1 battery cars, the Costco chargers stayed in place. 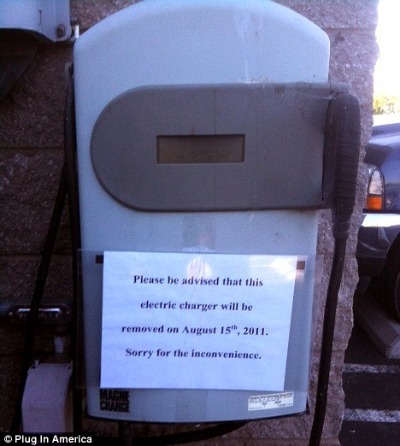 Yet just as plug-in cars like the Nissan Leaf and Chevrolet Volt enter the market, Costco is reversing course and pulling its chargers out of the ground, explaining that customers do not use them. Mr. Hoover said that E.V. charging was “very inefficient and not productive” for the retailer. “The bottom line is that there are a lot of other ways to be green,” he said. “We have five million members in the region, and just a handful of people are using these devices. Why is consumer demand for EVs — hence for charging stations — so low? Most consumers cannot afford a battery electric car or a plug-in hybrid. The biggest part of the expense is the lithium-ion batteries that power EVs. Three recent studies by the Boston Consulting Group (BCG) shed light on this formidable barrier to consumer acceptance. The Comeback of the Electric Car? How real, how soon, and what must happen next (2009) estimates that even if battery prices drop from about $2,000 per kilowatt hour (kWh) in 2008 to $700 per kWh in 2020, “a 20 kWh battery, which is needed for a driving range of 80 miles (about 130 kilometers) would still cost $14,000.” Absent tax rebates or other consumer subsidies, the five-year fuel savings would not offset the cost of the battery unless oil hits $280 a barrel. Batteries for Electric Cars: Challenges, Opportunities, and Outlook to 2020 (2010) estimates that, excluding subsidies, consumers paid $1,400 to $1,800 per kWh for EV battery packs in 2009. The report projects that costs will fall to between $570 and $700 per kWh by 2020. However, that would still be more than twice the 2020 commercial viability cost target of $250 per kWh set by the United States Advanced Battery Consortium. The study projects that automakers will sell about 1.5 million fully electric vehicles and 1.5 million plug-in hybrids worldwide in 2020, capturing 3-5% of the passenger car market in developed countries. That’s not trivial, and maybe a decade from now Costco could operate EV recharging stations at a profit. But as of August 2011, only 8,000 EVs were sold (or delivered to showrooms?) in the USA — about 0.1% of total light duty U.S. vehicle sales in 2011. Powering Autos to 2020: The Era of the Electric Car? (2011) contains, among other information, the results of survey research BCG conducted. Only 6% of U.S. and 9% of EU respondents in the survey were willing to buy a “green” car that costs more over the life of the vehicle. 38% of U.S. respondents were willing to pay $3,900 more on average for a “green” car if they can break even via fuel savings over time. A whopping 56% were not willing to buy a green car even if they could break even. Of those willing to spend more for a green car if fuel savings offset the higher purchase price, 71% expected a maximum payback time of 1-3 years. The bottom line: EVs may some day be a smart choice for cost-conscious consumers, but a mass market is unlikely to develop in the next decade. From which I conclude that Costco understands its customers better than its green critics do. Now that’s an ignorant and scientific fact-bereft comment if I’ve ever seen one. We have seen an enormous increase in the amount of CO2 in our atmosphere since the dawn of the industrial age coupled with increasing temperatures. Nobody is looking to attain “little CO2 in our atmosphere.” What is sought is a decrease in the rate of increased Co2 in our atmosphere and a return to levels in the past decades. Even if the planet has naturally occurring CO2 emissions, i.e. volcanic activity, bog decay release, why should we do everything we can to make this worse? Is that how you treat your children when they have a fever? Plunk em into the hot tub? Geologist? Educated when? Do you read any scientific journals today?? Just as I wouldn’t trust a doctor educated in the 30’s or 40’s who hadn’t kept up with the latest knowledge, I am firmly convinced that the crop of geologists who were educated way back when and who are constantly recruited to sign pledges of disbelief in climate change so as to add some “scientist cred” are far behind the knowledge curve in the field.